It is sad to see that my favorite game, the one for which I paid to have fun, is today cause for immense disappointment, sadness and frustration. In the past I reported the presence of hackers in WvW and today I see the same hackers in action in the pvp hancked and tournaments .... I know that have already been reported, but they are still there, humiliating us, mocking us, winning games by half of cheating without any respect for us that we play and act correctly. In addition to living with lags, we are forced to endure the presence of these criminals turning our fun into a nightmare, while you NOTHING DOES! Just look at YouTube to see that it is a chronic problem, for years, that it remains 'healthy' because nothing has been done to effectively end it. How much longer are we going to have to put up with this? Or maybe, it's better that you make it official, that it is allowed to use hack in the game, so that we at least have the condition to compete of equal to equal in that shame that has become the GW. And you know one thing .... I already doubt if you really want to do anything to change the nonsense that is taking place there. I do not speak English so I'm using google translator ... I hope he has managed to convey at least my displeasure to you all .... This is all a shame, a lack of respect with us that we pay to have a game ' clean 'for fun. Yeah ... I think those are the players you really want to have at GW. Unfortunately both pvp and WvW are full of bots and hackers. This is ridiculous! It does not have 1 day that does not report on average 15 players with bots and hackers. Arena.net needs to automate this ban ... it's becoming impossible to play honestly in competitive modes. sure. Sure you do, you report them from what? Bronze? Reportreportreport move on. 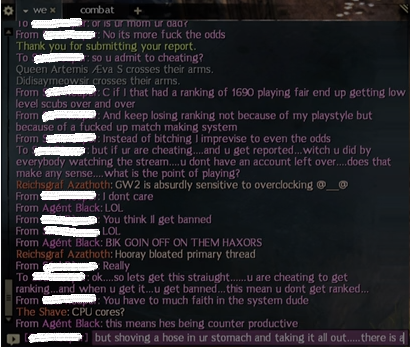 As players who witness such terrible acts we seek justice against these hackerous hackers, but in reality Anet needs evidence these players are using third-party mechanics for malicious intent. Screenshots given to them is very nice. yeah, you know that reports won't do anything, cause they don't care. also, some of those cheaters are anet employers like GM Wonder Tree. well, i cant say for 100% that it was him, just come to your own conclusion. We need your positioning on this barbarity... It is impossible to play any match in pvp/WvW. We do not need to check with prints, just any of you enter a match in pvp and you will see. Sometimes I get reported for winning a trade on sword weaver. I don't know if I should be happy for the report system not working or be sad about the spec. I am a casual PvP player, and being out of the situation, I believe this will take away both veteran players and prevent new players from entering. It is a shame that a company of this size is not paying attention to such a serious problem. I really hope i can buy the Path of Fire with no worries about all this things... Thinking twice now. My condolences to PvP players. For the Arena.net team that is having difficulty knowing where the hackers / bots are coming from ... search on google: GW2MINION, GW2 PvP Bot - Assist GW2Minion ... Well, there is a simple google search for the proof that they exist. I would like Arena.net to really give a due answer to the case. the last time anet banned someone for hacking was in may 2015. then their ESL dream bubble burst and since then they don't give a kitten about pvp/wvw anymore. the guy admitted to cheating/hack for months, even made money with it and Anet did nothing. soo either i am super lucky to not run into them or their hacks dont safe them. so by all mean ban all hackers, i just dont think there are that many as some make it sound to be..
i have been accused by my opponents several times in whisper, so i guess also reported for hacking. but i am certain i dont use any hacks. i think there are alot of false reports for hacking and therefor an automated ban system might not be that good. i further dont know if anet legally does need evidence for violating their rules to ban you at least when talking permanent bans, so that might be another problem. I did a little now (less than 20min) match in which the opponent was on the ground (again the guy and I alone) I of Deadeye shooting without stopping at him and he who was with the hp in downed the guy simply went healing until he arrived to 80%. I needed to finalize the guy so he did not get up ... someone downed gets take damage if he heals alone and get up? I do not think so unfortunately that's what happens. Who plays PVP and analyzes can identify many hackers, bots there. That's the reality. Arena.net has how to verify this, just does not do it if you do not want to. oh i do identify hackers, but stuff like that doesnt happen to me. i did rez people out of permastealth while people were attacking without ever poping out of stealth myelf.. but well you said the others were not there so i only have your word on it, dont know if you might just have overlooked someone or if you really encountered a hacker, cause you get interrupted channeling your rez when attacked and only can heal up while that if you casted abilities before that still have effect like guard symbol in downed, ranger pet, thrown elixir R? (didnt play engi for a while not sure wich elixir it was). to me there is nearly never a situation that i dont understand how my opponents did behave, when there are new balance patches it does happen that i am like "what was that?" but then i find the answer in the patch notes. I canal, I just play with many, thieves using Guardian skill, and engineers giving hit kill. Characters falling on down and teleporting. There is no way to play cheating. Guild Wars 2 game from the start and I know when a character and hack. I do not bother to lose anymore, always lose by having cheating in the game this I can not stand. I ask the customer and customer of Arena NET to do what is necessary for this to end. As you said yourself, you must be one of those very lucky guys who play and do not have the misfortune to find hackers in the game. It's ... you sure are a lucky guy .... But as others are not as fortunate as you and have already encountered and encountered these criminals, which is what they are, and it is something that occurs to the over the years with videos on the internet and reports to own Arena net, I've done it myself a few times, so yes, you have to do something to stop this clown from continuing and if necessary to automate actions to curb this crime ... Then, those that since I do not have to fear an automated means of action against the hackers, or that they are lucky like you, we hope that Arenanet does the part of it of truth and put an end to that shame. Well, how do you identify or not who is bot or hacker I do not know. I just know that you have it in gw2 and the site I've been through is there to show. If you want other links I can also find on google and go ... because it is very simple to find these programs on the internet. The reality is this, with or without patch or anything else there is bots and hackers yes, this is clear as mineral water. Most of the hacks aren't always that obvious. Combine that with people who hide it well and it makes it very hard. But yes, Anet needs to crack down on the bots/hackers or they won't have any other players in the game. I've basically given up on ranked PvP and WvW because of it. At least in unranked hackers are few and far between. you sound like someone who blames losses on bots and claims everyones hacking. You report 15 players a day... you're just bad. Today i had a fight with an engineer that evaded everything against 4 players at the same time. while two shotting them and he did it 3 times in a row with different people. The conceptors are bourgeois that dont care about people. This game is becoming a cancer. 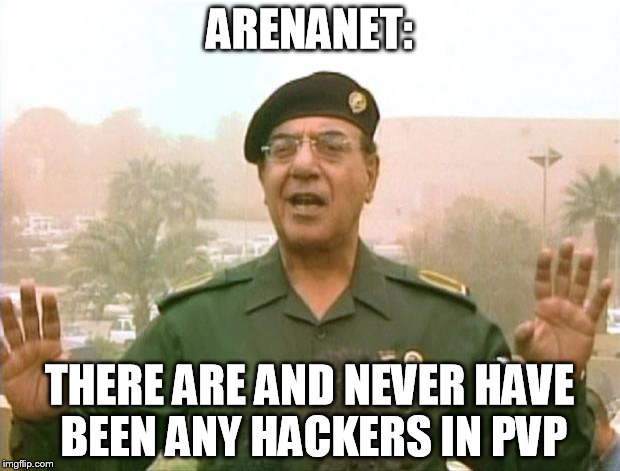 So... in a nutshell... Arenanet defends cheaters and punishes those who point out the cheaters. It's a bit more complex than that as to why this is happening, but it is unfortunately true. If you are interested in contributing documentation of players who cheat in competitive modes, contact me via this forum, privately. oh i do identify hackers, but stuff like that doesnt happen to me. So... in a nutshell... Arenanet defends cheaters and punishes those who point out the cheaters. sadly offender protection is always a high priority with those companies or in general to avoid scandals. its way easier to silence and ban those who dare to speak up, then those who actually did the deed. cause they are obviously easy to identify and the genuine root of the problem since they dare to shine the light on it. only cause i dont whisper to anyone that beat me that he is using 3rd party software...like i heard you did just yesterday..
its just that i can explain what my opponents do pretty much allways and you make it sound like: hackers, hackers everywhere! Yes, you are here solely and exclusively to generate controversy and covertly reverse a fact into a lie. In one of the posts it is said that 'laughed a lot'... but here nobody is telling jokes. And since you're dealing so lightly with such a serious matter, it seems clear to me that you're only aiming to upset. I dispense with your comments and politely ask you not to participate in this discussion, since your interest is not to add but to denigrate those who seek and find a solution to a chronic problem in the game. Good man, if you think I'm bad, that's your problem. I do not need to prove anything to players like you. Just like me, several others report as many bots / hackers as I do. If you're bothered about it just get out. And another, if you play because here we are charging Arena.net what is important, because you are probably one of those who support and use a Free account to stay here talking nothing with anything. Most of the time you can be trait of speed, runes, skills and even then you can not reach these guys ... That's because it's normal right? Show us videos of these hackers. I will make it very clear to those who come here to post: give up trying to transform the facts that this post addresses, known to Arenanet itself, in lies, because this intention for me means that you are part of exactly those I accuse. So, please, go find something useful to do instead of come here to disturb who takes this criminal situation seriously. Your efforts to want to denigrate this post is a fragile attempt by those who are afraid of being exposed ... you are wasting their time. Honestly, I’m not too confident in this community’s ability to recognize hackers. I mean, I wish I had a dollar for every time someone called me a hacker, because apparently thief teleports/shadowsteos are hacks and not core profession mechanics. Lag, not understanding enemy mechanics and bugs are more likely. Like, getting pushed or pulled into a wall isn’t a hack. Enemy lagging out or you lagging out is more likely than a ddos attack. Etc. Hackers , they are a fact of general knowledge, and Arenanet herself knows this. Contrary opinions only show naivety, lack of observation, incompetence, or attempt to conceal a truth. The problem that arises here is that since then nothing else has been done of FACT to prevent such actions from repeating themselves. Those who are bothered with my post, who knows why? and try to turn it into a situation of improbability, ignorance, inability ... are wasting their time. I've met quite few of these hackers recently in matches and I'm getting sick and tired of them. A few of them have a cheat that make most of their skill effects turn yellow and if they walk anywhere near you they are able to load you with all the condis in the game and you die in 1.25 secs. Another must be an Engi cheat as they turn yellow too which enables them to do 6x their base skill damage (3.5 -5K per hit) while CC'ing you at the same time. Then you have the unkillable guard that literally can just walk in a circle/or not move at all on cap and tank whatever damage you can dish out. Of course don't forget the invisibility cheat of being sniped from someswhere you can't access on the map....oh actually wait a minute......those are the new elite specs. Sorry. you cant argue with idiots, they will drag you down to their level and beat you with experience. "... they will drag you down to their level and beat you with experience". As I said: they are wasting their time!! Just yesterday I got whispered and reported for beating a burn core guard as a Water/Arcane D/F Weaver. He said he had 6 skills that apply burn and said that I was hacking because he can't stack them on me. Tried being helpful and linked him Ele's cleanse traits and told him that burn guard's weakness is that it doesn't have that much covering condis so cleansing burn is easy. Then I got told that I was using macro or whatever 3rd party apps. I was like seriously? Do you even need a macro for a non fresh air weaver with that 3s/4s attunement swap delay? I know there are a lot of hackers, have seen them a lot both in PvP and WvW. Mostly those using speed hacks/short range teleports. But sometimes, those people reporting just really don't know how their own builds work. Let alone how other specs builds work. On very op kitten so beast that he/she can carry a team of 5, 4 of which are chosen randomly, for 70 strait wins. Yea, there are absolutely no hackers anywhere in this game. I am rank 60 in PVP right now so i have done fair share of PVP ranked games and i have yet to find a hacker. I would say hacker who is clearly indistinguishable, he will be unkillable, will be flying, moving from one place to another in an instant, one-shot people but i haven't seen any such player yet. Yes i have seen players who will do something like spawn and keep feeding mid 1 vs 4 and won't listen to whisper or team chat. Maybe they don't understand english, maybe they are bots but its not very common. You are sounding like this game is filled with hackers but i don't agree with you. Besides, it will be impossible for ANET to manually check every report and act on that. They will forgive 4 hackers just so that 1 person who got reported but wasn't hacking don't get falsely banned. Since GW2 is online only game simple tweaking to your core game files won't work. It has to be a memory hack and it can be easily detected if Anet implemented something like valve VAC bans which automatically detect and ban hackers on a delayed basis, its 99% accurate and VAC bans are permanent and non-negotiable in any case. I've never seen a Bot in pvp until 2 Seasons ago. Out of 1000 matches in the past 2-3 seasons I've only seen 3 Blatantly obvious bots. (Yet to see any blatant hacks past a bot, other than some obvious ones posted on youtube). Yes there some out there, but they're still a rare occurrence. So don't let a few bad matches sully your experience. If at worse, que dodge if possible if you are getting the same player. Seen more people position hacking/mining nodes in Malchors Leap in one day, than years of playing pvp. Well, I just came out of a PvP match (for daily) and we stumbled on a Druid ranger who took zero dmg no matter we threw at him. We even tried 3 vs him (ranger, necro and warrior) and his hp bar would not come down, not even one point. It's feasible for a Druid to 1 v 3. Especially if it's a High tier vs low tiers. Although you'll more likely see a 1 v 3 with Bunker guards. Would need Video evidence of the Druid taking absolutely Zero damage through the entire skirmish. I know ANet doesn't comment when they ban someone or take any actions, but would be nice to have a feedback on this one, so, you know, we could have a little of our "faith in the system" restored.